Gold coast is a popular holiday destination not only because of the luxurious accommodation options and world class restaurants but also because of the many recreational activities visitors can enjoy. With more than 50 kilometers of coastline and water temperatures of about 22 degrees Celsius, the city encourages many outdoor activities and adventures. Here, you have wonderful opportunities for canoeing, kayaking, paddle boarding and fishing from kayaks. There are plenty of kayak hire Gold Coast centers that can provide rental crafts perfect for your adventures. Surfers Paradise is one of Gold Coasts most idyllic places to enjoy kayaking. You can enjoy a sunset kayak tour along the Nerang River, glide past the city’s lavish waterfront mansions and the spectacular skyscrapers in Surfers Paradise. Organized tours can take on a number of adventures including sunset paddling, sightseeing and exclusive tour of the city. You can also hire a kayak for a self-guided tour and adventures to where you please. Broadbeach provide lots of opportunities for outdoor activities. The area boasts of canals with scenic waterways, aboriginal sites and beautiful beaches for spending time in. With Broadbeach kayak tours, you can enjoy a romantic sunset tour, amazing family tour and team building group tours. You can also hire a kayak and take on a self-guided tour to catch sight of beautiful dolphins, the colorful birds and the sea turtles found along the coast. There are plenty of Kayak Hire Gold Coast companies in South Stradbroke and Wave Break Islands because of the endless opportunities available for swimming, kayaking, snorkeling and paddle boarding. Kayaking from Biggera Waters to the beautiful South Stradbroke Island can be a wonderful adventure. You’ll get a perfect opportunity to spot the dolphins, tropical fish, wallabies and birds. If you’re looking for a more relaxed kayaking experience then the Currumbin Creek in South of Gold Coast and Coombabah creek in central Gold Coast are the best spots to visit. AT Currumbin Creek, you can launch from Berre Badalla, Palm Beach and head downstream or to Tarrabora Reserce for unlimited kayaking experience. At Coombabah Creek you can get from Jabiru Island Park and go upstream along the creek all through to Coombabah Lake on return trip. 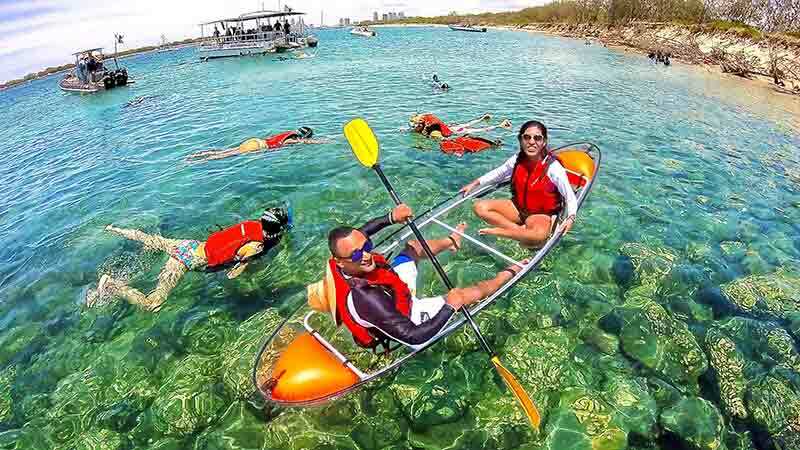 Major Kayak Hire Gold Coast centers have a variety of kayaks, boats and canoes for hire. You can hire for sit-on top single kayaks, sit-in double kayaks or fishing kayaks. These kayaks are ideal for people of all ages and can be used by individual trips, family tours and team-building tours. Contact the Gold Coast based kayaking centers to make a booking today. Start your kayaking adventure today! CLICK HERE to search for the best Gold Coast kayak hire centers at Kayak Hire Australia.